What you eat and your ability to have a restful night's sleep are closely linked. In the same way that you need certain nutrients to keep you alert during the day, you need select compounds to enjoy a nice, deep slumber. In all cases, you should avoid large meals four hours before bedtime, as the digestive process can keep your body awake. Otherwise, it is important to know what to include and what to avoid if you have constant interrupted sleep. This article breaks it down for you simply and clearly, encouraging cozy, dreamy nights. Although protein is necessary to promote good sleep, too much can be detrimental to sleep health. Studies have shown that excessively high protein intake is associated with difficulty in staying asleep, one of the main symptoms of insomnia. In general, it is best to stick to a moderate consumption of low fat protein sources, such as turkey breast or tofu, which also contain tryptophan. Coffee, soda, and chocolate should be banished before bedtime. These foods contain caffeine, which is a powerful stimulant that increases energy levels, which is the opposite of what you need when you lay down to sleep. For a nightcap, try one of the abovementioned relaxing herbal teas instead. Recent studies have verified that magnesium deficiencies are linked to sleep disorders. Individuals who do not have enough of this mineral in their blood are significantly more likely to have trouble resting their mind at the end of the day. Magnesium-rich foods include dark leafy greens, wheat germ, and pumpkin seeds. This essential amino acid encourages the production of melatonin, a neurotransmitter that is essential for inducing sleep and maintaining circadian rhythms. It is a good idea to have a small snack that contains tryptophan before sleep, such as warm milk, a banana, or a small slice of bread with peanut butter. However, increased tryptophan may not be helpful for severe insomniacs. This is a powerful medicinal herb that contains biochemical compounds and alkaloids that induce sleepiness. It is considered among researchers to be as effective as some sleeping pills. In addition, it does not have any known side effects, making it safe for long-term use if necessary. Try a tea or supplement to sleep like a baby through the night. 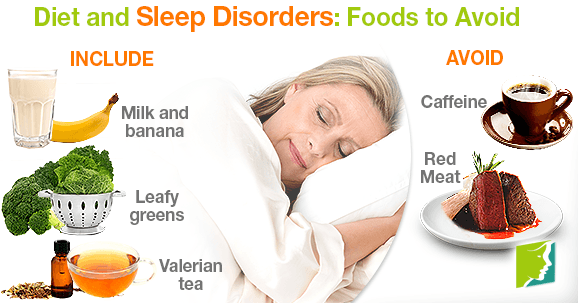 These simple diet tips are a first recourse for avoiding sleep disorders. With a little rearranging of what you eat throughout the day - and when - you can be relieved of insomnia and other sleep problems while boosting your overall well-being, too. Dietary adjustments are just one of the lifestyle changes that improve sleep. Read all about postmenopausal sleep problems and disorders, including causes and treatments, so that you can finally get a restful night’s sleep.